Super bright and small enough to fit in the palm of your hand, the Olight M2T Warrior is a perfect tactical everyday carry flashlight to help you accomplish all your tasks. Equipped with a powerful CREE XHP35 HD LED capable of a 1200 lumen max output and 213 yards of throw, it's great for searching, exploring and camping. A silent three-in-one tailcap switch helps you remain discrete in tactical situations and gives you quick access to constant, momentary illumination and momentary strobe modes. A second side switch located near the bezel of the light gives an alternative option to powering on/off the light, cycling through six brightness levels while providing a more comfortable handling option for everyday uses like camping or working. The side switch also allows to you engage the lockout mode which prevents the light from accidentally activating while your on the go. 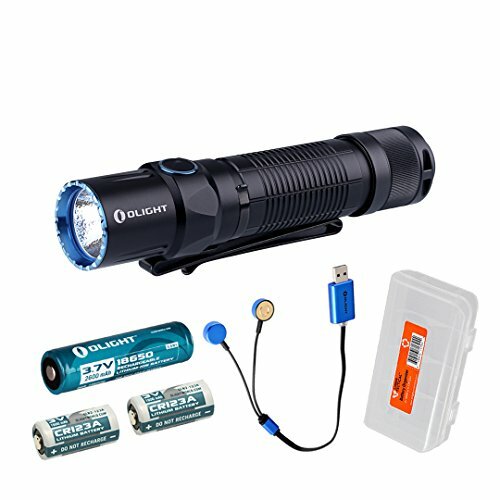 This compact and high performance flashlight is powered by a single 18650 battery (>5A output) or two CR123A batteries for up to 50 days runtime. The M2T Warrior even includes two CR123A batteries so it's ready to go right out of the box. The durable aluminum alloy body is dust-proof, waterproof and impact resistant, making it great for all weather uses. And the M2T Warrior includes a pocket clip, holster and lanyard, providing you with multiple carrying options for daily use. HIGH PERFORMANCE OUTPUT - Fitted with a CREE XHP35 HD LED, the M2T delivers up to 1200 lumens output with 213 yards of throw for a super bright output you can use for everything from tactical to general uses like camping and exploring. TACTICAL TAILCAP - A unique 3-in-1 tactical tailcap offers easy and direct access to Momentary (soft press), Constant (medium press) and Instant Strobe (hard press) outputs while remaining silent so you'll always have the upper hand in urgent situations. SIDE SWITCH CONTROLS FOR EVERYDAY - For more general uses like camping or searching, the side switch offers comfortable and easy access to On/Off and output adjustment where you hand naturally rests. The side switch also allows users to lockout the light during travel to keep it from accidentally turning on. OPTIONS FOR EASY CARRY - Carry the M2T your way with the included pocket clip, holster and lanyard accessories. The dual direction, deep pocket clip conceals the light discretely in your pocket or use the holster for attaching to a duty belt. And of course the lanyard makes it easy to hold onto when using for everyday purposes!